In a fast-moving, competitive retail landscape, it has never been more important for retailers to intentionally create exceptional experiences for shoppers – in doing so, you build customer loyalty while also driving basket size. And as a customer, part of a great experience is feeling like a retailer knows you personally and offers you deals they know you’ll get excited about. Delivering an in-the-moment, personalized offer is not a task that can be done manually, especially at scale, with infinite promotion variables. 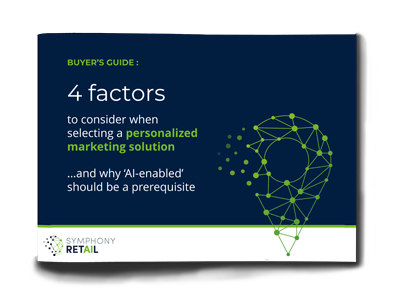 In this buyer's guide, discover the 4 key considerations when selecting a personalized marketing solution in order to deliver smarter, faster and, more importantly, relevant personalized marketing campaigns. Does your marketing solution support your strategic objectives and business rules for personalized marketing, allowing you to efficiently execute omni-channel campaigns? Can this solution provide one version of the truth in addition to minimizing errors and improving efficiency? Does it leverage AI to enable you to offer the next generation of personalization, delivering the right offer to the right customer at the right time and channel?